The day trader's online broker | Take my money! 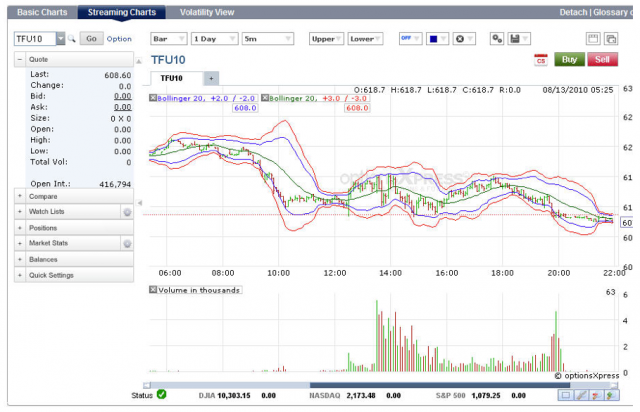 If you're going to be a day trader, your main tool of the trade will be the online broker. And as a day trader, you will learn very quickly that part of the trading experience with an online broker is dealing with problems. The second something goes wrong, you will realize how much you are depending on your online broker. There is nothing more annoying and frustrating than those times when you cannot place a trade because the system is down. Late fills, system crashes, back office problems, commission overcharges, and trade discrepancies are all an inevitable part of life for the online day trader. And the always seem to happen at the worst possible time, when your money is at risk. You must prepare yourself accordingly. One of the most important decisions the day trader can make is to choose the right online broker. The problem is that the investing world is saturated with online brokerage firms. How do you know which one to choose? Simple: cost first, service second. Why price? Because the difference between a 8$ trade commission and a 14$ trade commission over the course of a year can be very substantial. When choosing an online broker, there is really no way to tell how reliable the firm's service is going to be. It is always going to be a case of trial and error. That way, if there are consistent problems, you can merely move your money from the old firm to the new one. With no down time, no missing out on potential earning. The online brokerage industry is notorious for system failures, and no one is immune to these problems. Some firms are better than others, but unfortunately, you may find this out the hard way. I think the most annoying aspect of trading online is the late fill. This occurs when you buy a stock, and minutes or hours later it is still not in your account. Even worst is when the entire web site is down. In this case, you will be prevented from accessing your account to get up-to-the-minute information until the system is running again. A unpredictable situation is that the site is bogged down due to heavy traffic, and your operations might be delayed, and the system might end up doing something undesirable, i.e you place a buy order, but the system is so slow that the price increases before the order is completed, so you actually buy it at the higher, unwanted price. An other rare situation would be that the system has no recorded your operations correctly, or mistakes where committed by the online broker, or trade discrepancies arose, for example getting hit by commission overcharge. There are of course worst things that can happen, like shares disappearing from your account. The only way to deal with this is to keep a meticulous logbook (hour, date, confirmation number, stock amount and name, etc) and contact customer support.